1. Deal stage is a lookup type field, meaning it refers the actual stages you have configured in your HubSpot setup. To map this field, ensure that your CSV contains values there which match your HubSpot setup. 2. Pipeline, just like Deal stage, is a lookup field. This means you should have in your CSV the value(s) which correspond to an actual Pipeline setup in your HubSpot account. 3. Owner is also a lookup field, which means that it will look at the users that exist in your HubSpot account. You must have the owner setup prior, and have their identifying information in your CSV file (like email address, or name) which matches what is in HubSpot, in order for the mapping to work. 4. Close date is an actual date field, which means that your CSV should have a valid date in order for the mapping to work. During the mappings step, you can select the format of the dates in your CSV file so that is properly recognized during the import. All dates in this column in your CSV should be in the same format. 5. Deal Type is an example of a picklist field. You must have the same list of options setup in the field as those that exist in your CSV file in order for the mapping to work. The same logic applies for any other picklist fields you wish to map on the Deal record. 6. The associated company is an actual lookup (link) to a company record in your HubSpot database. You can map this field to link records during the import, as long as you have a column in your CSV to identify the company to link to. Any field on the company record can be used as the way to link - name, address, domain, or even a custom field of your choosing. 7. The associated contact is an actual lookup (link) to a contact record in your HubSpot database. You can map this field to link records during the import, as long as you have a column in your CSV to identify the contact to link to. Any field on the contact record can be used as the way to link - name, phone number, or even a custom field of your choosing. 8. 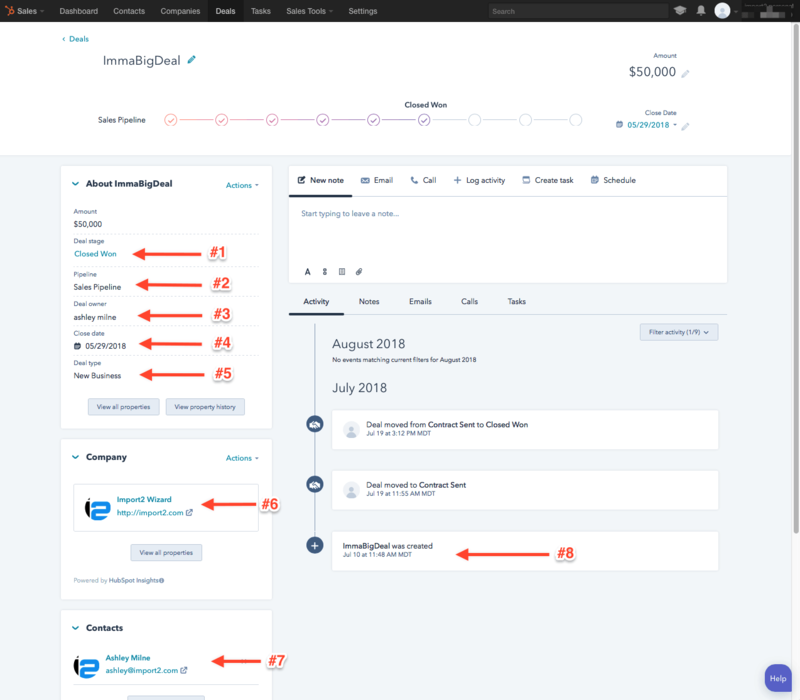 HubSpot assigns the create date in the timeline when you import the record. This cannot be changed. You can import the actual create date field in the "About" section on the left, but this will not change the timeline date/timestamp.